Pocket Labs, the research team led by Lei Li, assistant professor in the Washington State University School of Mechanical and Materials Engineering, is also a startup that began in Innovation Corps (I-Corps) in fall 2016. The National Science Foundation (NSF) developed the I-Corps program in 2011 to help move academic research from the lab to the marketplace. Last year, the NSF provided WSU with a three-year grant to make the University one of 51 others participating in the NSF National Innovation Network. Led by the Voiland College of Engineering and Architecture, and in partnership with the Carson College of Business and College of Arts and Sciences, WSU teaches entrepreneurship skills while encouraging interdisciplinary collaboration, industry mentorship, and alumni engagement. WSU I-Corps participants attend weekly sessions where the teams, directors, and mentors develop and refine their business models, discuss lessons learned, and prepare for further customer discovery. The Pocket Labs researchers knew we live in a time when patients and medical professionals expect fast results, and they were up for the challenge. Testing for pathogens, antigens, and other biomarkers requires specialized equipment, electric generators, and lab space, all of which can significantly reduce the effectiveness of governmental, non-governmental, and other non-profit organizations. The Pocket Labs system enables a mobile response team to increase efficiency and decrease cost. Although smartphone spectrometers already exist, they only monitor or measure a single sample at a time and are inefficient for real world applications. Li’s team created an eight-channel smartphone spectrometer that can detect human interleukin-6 (IL-6), a known biomarker for lung, prostate, liver, breast and epithelial (tissue) cancers. 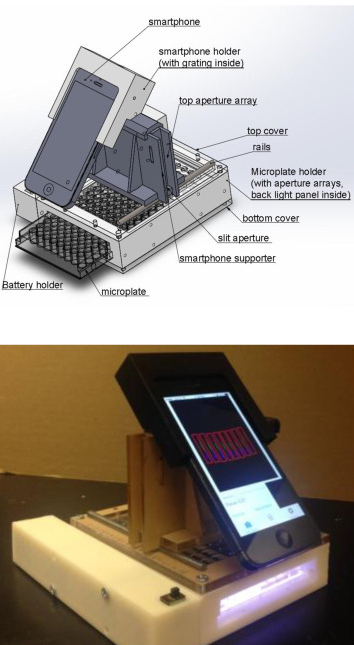 Li’s team used a multichannel smartphone spectrometer (MSS) as an optical biosensor that could simultaneously sense multiple samples. A 3D printed cradle holds the smartphone integrated with optical components. 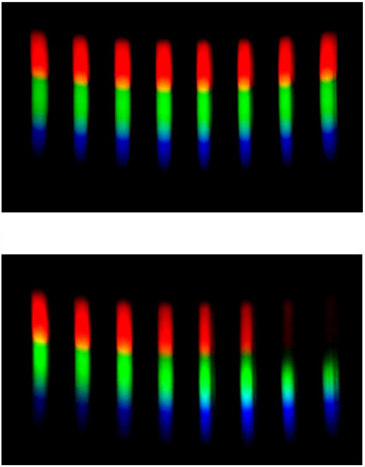 A custom smartphone multi-view App was developed as well to control the optical sensing parameters and align each sample to the corresponding channel. Pocket Labs’ low-cost, portable smartphone laboratory not only analyzes several samples simultaneously but also produces lab quality results. Researchers who take bio detection technologies used in the lab, and have to translate them to the field and clinics, can provide an almost instant diagnosis to patients in a physician’s office, an ambulance, or the E/R. Li’s multichannel spectrometer can measure up to eight different samples simultaneously using a common test called ELISA, or colorimetric test enzyme-linked immunosorbent assay, which identifies antibodies and color change as disease markers. With its compact size, minimal weight, low cost, and data transmission function, the multichannel smartphone optical biosensor will be useful in high-throughput point-of-care diagnostics. So far, Li’s group has only used the smartphone spectrometer with standard lab-controlled samples, but their device has been up to 99 percent accurate. They are now applying their portable spectrometer in real world situations. Pocket Labs has many potential markets to choose from and has spent time interviewing medical professionals to figure out where they might take their product first. One of its capabilities includes a consumer test product for hypokalemia/hyperkalemia—too little/too much potassium in the body—an indicator of many illnesses, including kidney and cardiac diseases. In the spring, Pocket Labs will look into the network of the medical testing industry. They wish to see which partnerships they need to create with local doctors under the new partnership between Pullman Regional Hospital and WSU to help create the baseline data to demonstrate their test’s efficacy. Li and his team’s work received funding from the National Science Foundation and a WSU startup. Their research falls under the vision of WSU’s Grand Challenges—a suite of research initiatives aimed at solving large societal issues. The work is particularly relevant to the challenge of sustaining health and its themes of healthy communities. The I-Corps program helped them identify the first market and customers for Pocket Labs, and the travel funding enabled them to find the business partnerships necessary to tap into the medical diagnostics market.